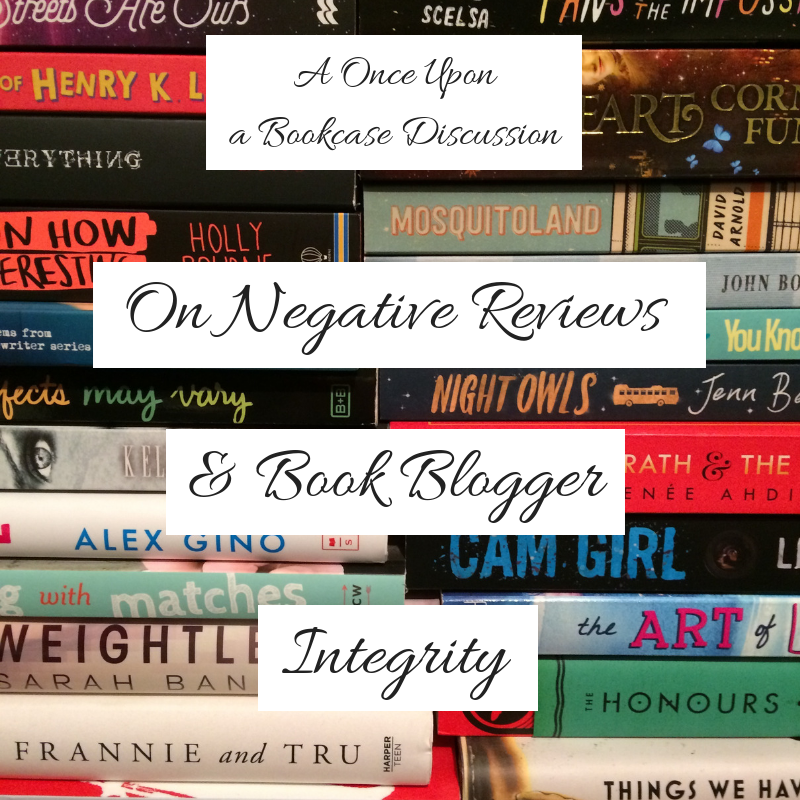 Today, I want to talk about negative reviews and book blogger integrity. It's a conversation that I'm sure has happened many times before, but I don't think I've ever stated what my thoughts on negative reviews are on my blog, and as it's something that came up - briefly and quietly - not that long ago, it's something I've been thinking about. Firstly, there's absolutely nothing wrong with a book blogger disliking a book they've read. Even if it's a book that was sent to them by a publisher or author, or something they got through NetGalley or Edelweiss+. Just because you've been sent a book doesn't mean you have to like it. And let's be real, what we enjoy and what we don't is so subjective, we're just not going to enjoy everything. Sometimes, book bloggers may get sent unsolicited books that they may not have accepted were they asked beforehand if they would like a copy. I know there are some book bloggers who feel they should read all books they are sent, even unsolicited ARCs they don't like the sound of. You don't have to, but if you choose to, it's fine if you don't like the book. Sometimes, book bloggers will request/accept ARCs of books they think they will enjoy, and then find out they're actually not enjoying it when they're reading it. This is ok, too. As long as we all know we don't have to accept every book we're offered, and we don't have to enjoy the books we do get sent, we're fine. Now, when it comes to negative reviews, there are some book bloggers who choose not to review them. This is also fine. The choice is theirs, and I'm sure it's stated in their review policy. I believe when this is the case, these book bloggers email their contact at the publisher, or submit their thoughts on NetGalley or Edelweiss, and give reasons for why they won't be reviewing it. A book blogger absolutely does not have to write negative reviews if they don't want to, or are uncomfortable with doing so. It's possible that you might think writing a negative review makes you seem ungrateful over the fact that you have been sent an ARC, but that's not the case. People in publishing know you're not going to enjoy every book, and they're not going to hold it against you if you write a negative review, nor will they stop offering you other books in future. However, a book blogger does have to be honest. A book blogger must decide whether they will write negative reviews or not. I do write negative reviews, and I do so because I like talking about books. I want to share when I love books, why I loved them, and how much I want everyone else to read them. And I want to share when I've been disappointed, why I've disappointed, and maybe even have a little rant. Case in point, my review of A Room Away from the Wolves by Nova Ren Suma. I was so disappointed with that book because there were no answers, and it was so frustrating, and I wanted to express that frustration. And that's ok. As long as your review is fair and honest, and you give reasons to back up why you didn't enjoy a book, that's perfectly fine. And writing negative reviews isn't necessarily a bad thing. I've had people comment on negative reviews in the past to say that, although I didn't enjoy the book, I reviewed it well enough for the reader to see that it was the kind of book they would enjoy, so they were going to look it up. If you talk about the different aspects and elements of the book - characters, plot, writing, etc. - and what you liked or disliked about them, you're giving your opinion but also enough information for your reader to decide whether it's something they themselves would enjoy. A negative review can still lead to more readers for a book. What a book blogger absolutely must not do is lie, and write a positive review for a book they didn't enjoy. That is just really dodgy. You are lying to your readers. And it would make me question why you're a book blogger in the first place. Because it's not for the community, or the love of talking about books, or the joy of writing (I personally get a huge amount of joy in the writing of each of my blog posts; putting thoughts into words is something that I really enjoy). You're book blogging for the free books. And that absolutely is not the reason you should be book blogging. Getting free books is a perk of book blogging, but it is a privilege. We are not owed free books, we are not entitled to free books. We end up getting free books when publishers see our passion for books and reading, the love for book blogging itself, the joy in recommending and seeing other people pick up books we love, and for the time, effort, and care we put into our blogs and our reviews. If you are lying in your reviews to get free books, you may have a passion for reading, but your passion is selfish. Yes, I know books are expensive. I myself couldn't afford to read like I do if I didn't receive free ARCs. But I don't blog for the free ARCs, I blog for the love of it. There are giveaways you can enter, there are libraries, there is even OverDrive, where you can borrow free eBooks from libraries. There are options available to get free books that don't involve lying. Book blogging has grown and changed, and has become something that has a real effect on book sales. It might still be a small effect in the great scheme of things, but it makes a difference, which is why publishing/blogger relationships have developed, and why we get offered interviews with and guests posts from authors, extra content to share on our blogs, because our content can translate into sales. We are so lucky for all we get from publishers and authors, but we only get it because it benefits them. As soon as book bloggers are no longer helping to sell books, we'll stop receiving the books and the interviews and the extra content. And that will happen when our readers stop trusting us, because they've realised some of us lie to them, and so won't necessarily buy books because of what we have said on our blogs, because they don't trust what we say, or they stop reading our blogs altogether. So lying to get free books could end up in you not getting any free books at all. Book blogging is our hobby, it's a way of sharing our passion, and it's meant to be fun, but we also have a responsibility to our readers, and to our publishing contacts, to be honest. Fair, but honest. And we owe it to our fellow book bloggers to have integrity. There is nothing wrong with writing a negative review. There is nothing wrong with not reviewing books you didn't enjoy. But to say you love a book when you don't is out of order. Doing so gives the rest of us a bad name. We who love what we do, and put so much time and effort and care into this thing we love. If you cannot be honest, if you are just out for yourself and what you can get, then I don't think you should be book blogging at all. Over to you guys. What do you think about negative reviews? Do you write them or do you choose not to? Have you ever decided to read a book based on someone's negative review? What are your thoughts on lying in book reviews? Great post. I mostly don't write negative reviews. The point of my blog is to review books I recommend but there are a few on my blog. I always am honest and state what I didn't like and who might like it better. Honestly it never occurred to me to lie in book reviews and I hope no one does that. As you said, if readers don't trust us, they won't care about our recommendations. And I think that's perfectly fine. If you don't want to review books you didn't enjoy, you don't have to. But it's the lying... that's just awful. Honesty is so much better. I personally think reviewing books negatively is fine, as long as it’s done respectfully, and isn’t snarky and/or mean. And I definitely think it’s better than lying to your audience and saying you liked something when you didn’t. I think publishers accept that when they give out ARCs they are doing so for an honest review, and not everyone is going to like every book. Thanks Laura! Yeah, lying is just dodgy, and I really don't think I'd trust a reviewer if I felt I couldn't believe them. And it could have such awful repercussions for the rest of us. I don't review books anymore unless I would be able to round up to 4 stars on Goodreads. That's specific to me since I'm querying my own book now, and it feels like a bit of a conflict of interest to post negative reviews. But if I don't like a book, I just don't review it. I wouldn't lie about it. That would just be weird. And that's fine! Choosing not to review books you didn't enjoy is perfectly ok, whatever the reason. But yeah, lying is just not ok.